Two photos of an icicle hanging from my roof are so similar but very different. 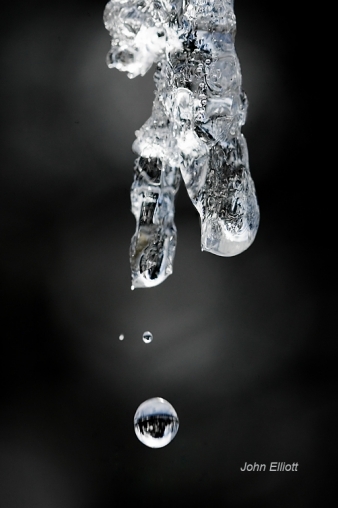 I clicked a burst of the shutter just as the drop left the icicle and captured the droplet as it fell. I did this many times and two came out very nice. Notice the shape of the drops and notice that the one large drop released tiny ones as it fell. The drop starts out a bit flat on the top and become rounder as the drop falls.